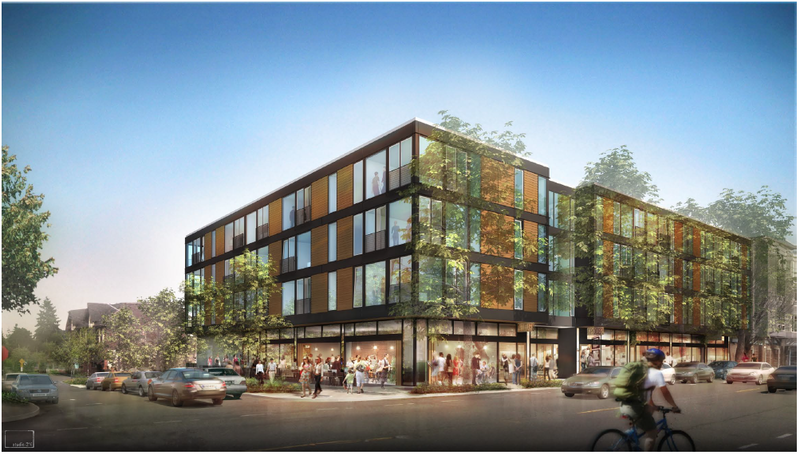 Just when you thought you might have to give up your membership in the Densify Capitol Hill club, two teen Ave projects come through the Seattle Design Review process to inspire you for the future and give hope that building up the city doesn’t mean turning the neighborhood into garbage. 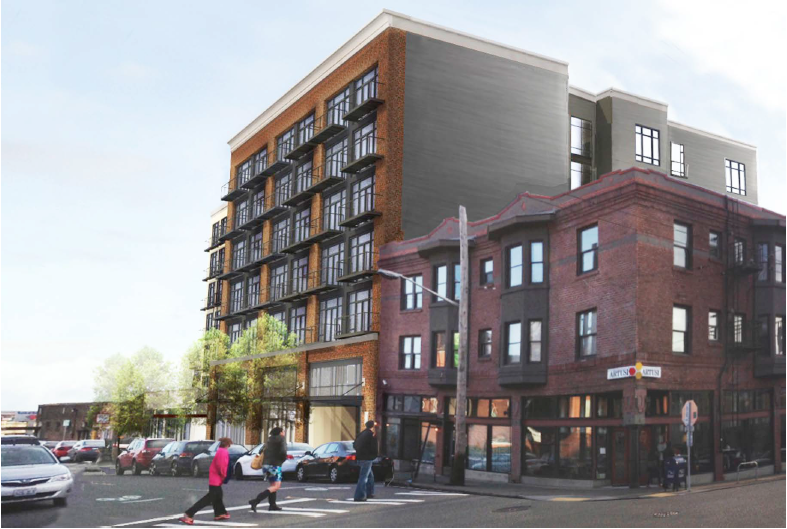 This week, the East Design Board prepares to give its final blessings to a four-story project on 19th Ave E and, the biggie, six-stories of mixed-use — and a little historical preservation — on 14th Ave. Details on both projects are below. Stop us if you’ve heard this one before: Successful strip of retail and beloved neighborhood coffeeshop displaced by mixed-use redevelopment of an early 20th century Capitol Hill building. The public reaction to the 1515 14th Ave project has been a far cry from the gnashing of teeth set off by the Bauhaus situation. Is it because of Porchlight Coffee’s youth? Or is it because people hold the 1925 converted store fronts less dear? Something else? Our company has officed on Capitol Hill for over seven years we bought and re-habed the Starlight Video and Exotic Tan tenanted building located at 1318 East Pike into what is now Old School Frozen Custard, Rock Paper Scissors as well as our offices. We are active in the PPUNC and look forward to being good neighboors in the future. We plan on preserving the facade of the Porchlight Coffee Building and intend to keep all of the existing tenants and move them back into the new building once the retail is finished. The partners have also met with community groups and neighbors to discuss the project’s updates including a session with the Pike Pine Urban Neighborhood Council earlier this month. in advance of this week’s design review recommendation meeting. Also helping — Johnson Architects has a pretty solid track record in the neighborhood with Trace Lofts and the Packard Building under its belt. Public comment at the project’s first design review in October raised issues over the size and scale of the six-story project which will be the tallest structure on its block when completed — though it will eventually have plenty of company. 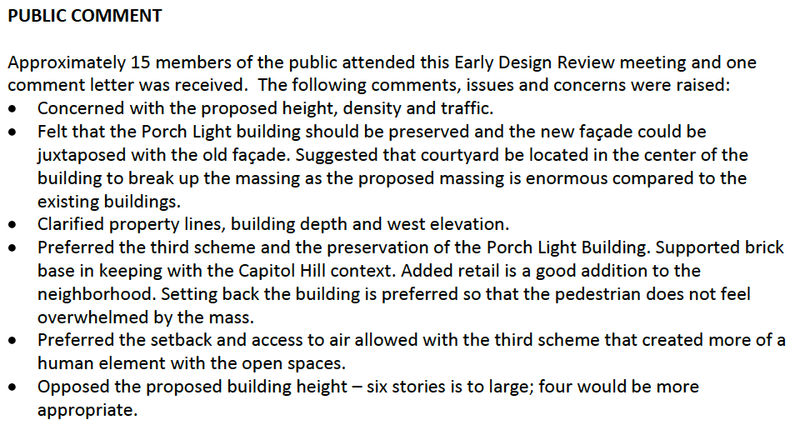 In sending the project through to the final design recommendation phase, the board’s main concerns were how the project would interact with the neighboring Chester Building and creating a design that better highlighted the preserved facade of the existing retail shops. Plans call for a six-story apartment building that will incorporate the facade of the storefronts that Blue Sky Cleaners, Meza, SPUN Collective and Porchlight Coffee call home and demolish a single family home and the building housing 60 Minute Photo neighboring Cascina Spinasse’s building at 14th and Pine. 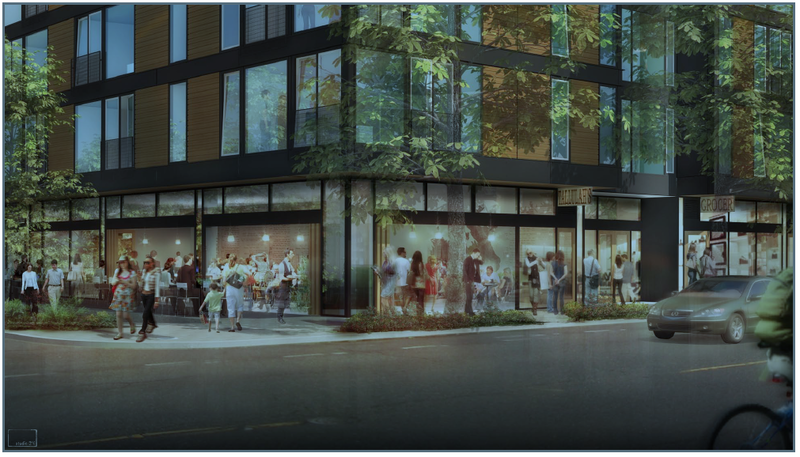 The building is planned to have 103 units, six retail units totaling 5,200 square feet plus another 1,000 of mezzanine space and a generous 101 parking spots — the first 1:1 unit to parking ratio development we’ve seen on the Hill in a while. Falling within the Pike/Pine Conservation district, the project qualifies for preservation incentives that allow greater height in exchange for retaining character structures. There are no incentives for retaining neighborhood coffee shops — yet — but we’re told solutions are still being worked out for existing tenants. The existing tenant at 19th and Mercer is one of a kind, too, but the Holiday Craft Store is about to make way for this four-story project as it moves into the final step in the design process this week. 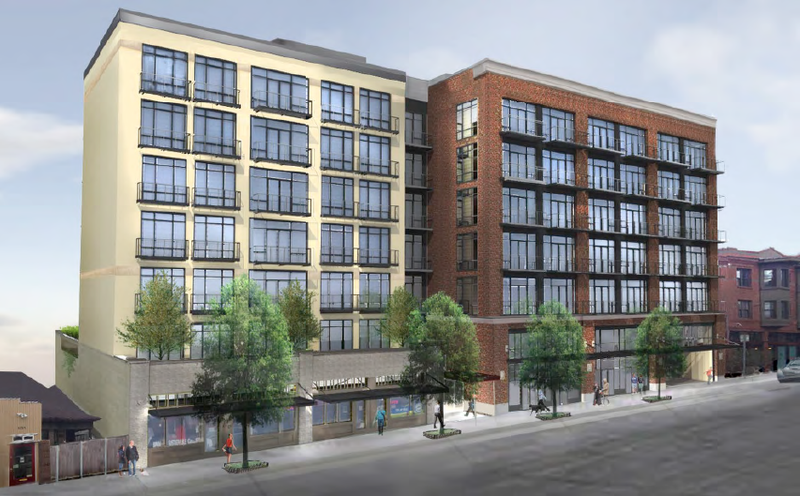 We first wrote about the mixed-use project that will replace the Holiday Craft and the Capitol Hill Hair buildings back in September. The building is envisioned to include around 50 apartment units and some 6,000 square feet of retail space with an underground parking structure including 35 stalls, plus space for parking 14 cars on the surface. Developer Lake Union Partners and architects Weinstein AU have been meeting with businesses and residents in the area about the project that will demolish two existing commercial structures and replace the large parking lot across the street from the Kingfish Cafe building. 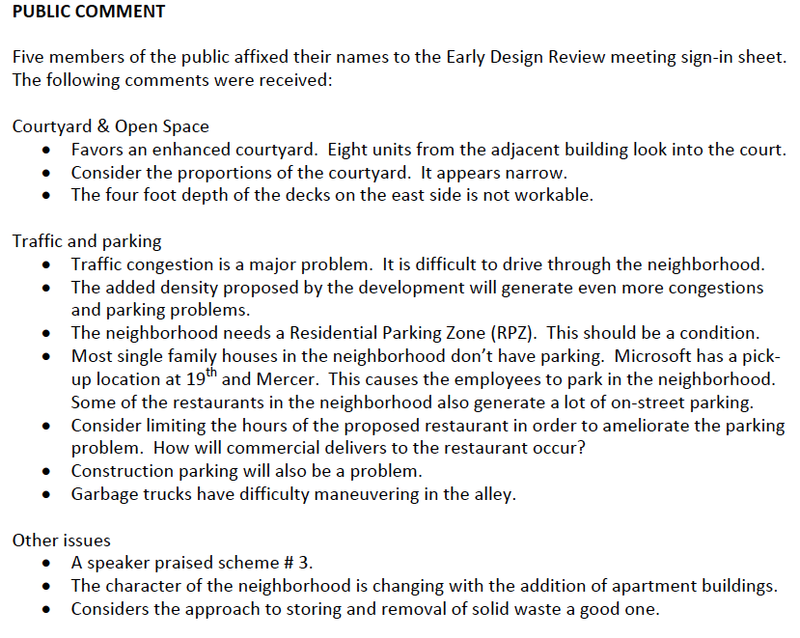 The board’s concerns were centered on improving plans for how the alley behind the project off Mercer will be used, improving the design of the building’s courtyard in sending the project on to the recommendation phase. The developers have also requested zoning departures to allow only “small” parking spaces and a 40% reduction in the “residential amenity” area required by law. 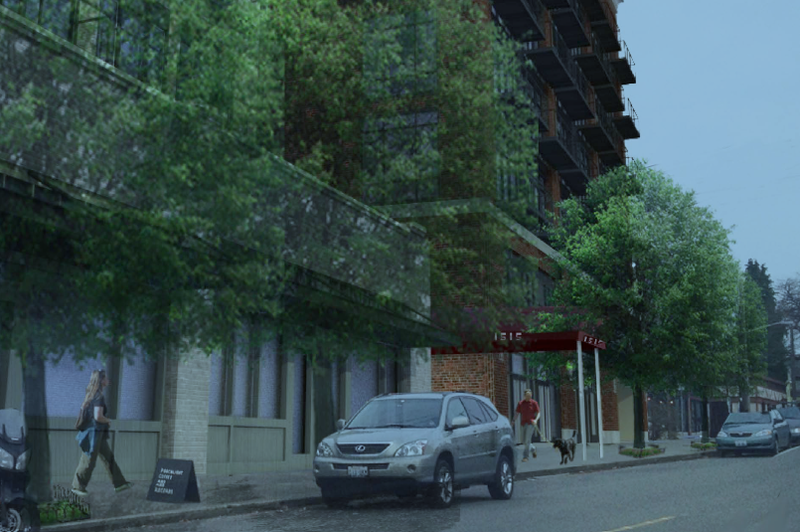 Presumably, the future residents will find plenty of amenities out and about on 19th Ave E.
Just wanted to let everyone know that we’ll be within a block of our current location during construction and back in our original location afterwards. All will be well! Isn’t very bella with that big old blank wall. Slap some windows on that side. Yes, we know, you are foreshadowing leveling the beautiful older building next door and putting up another building, but why not try just blending old and new? It’s pretty cool sometimes. Zack, Do you know when construction will begin? My guess would be air rights of the neighboring building. Any windows would have to be set back from the property line. Just a hunch. As far as I know, things are still unconfirmed and up in the air. Yeah, who cares about building codes and life safety issues! Who needs architects and city planners when we can simply get anonymous, uneducated blog commenters to design our buildings. How hard can it really be? And it could be pretty cool (especially that part when the entire block goes up in a massive conflagration). Both of these firms are likely too late in this over-heated cycle. By the time their buildings are finished, rents will have stagnated with so much supply coming online. Good for renters, not so much for “me too” developers. the cutest part of your comment is that at once you are guilty of making a stupid troll-esque comment under the veil of anonymity and that you are also passing assumptions based upon a comment on aesthetics that wasn’t just an opinion (Bella = beautiful. Big blank walls = ugly to many folks), but is also well documented and agreed upon by a good chunk of people in neighborhood planning since probably about the 1960s. Big blank facades are boring (see: many desolate areas of downtown for examples). Literally every aspect of a building’s design influences the community around it. Also, yeah I made this observation because on the same face, there are other windows, but you know, your opinion trumphs mine. Humanity! 1. Don’t know the building code but I was a fire insurance property inspector and any openings in the wall of a building adjacent to another with a combustible roof would definitely pay a penalty. 2. There are likely various things being exhausted through the roof of the lower building that one might not want entering any opening in an adjacent building. Weinstein A|U consistently puts out good work. This project is simply another example. I love the pocket neighborhood down on 19th and I’m happy to see it extended a bit. This project looks like it’ll be a great addition to the retail strip down there. Well done. The other project is nice and restrained as well. It’s nice to see projects that aren’t overwrought with facade and material changes. I may be in the minority on this one, but my heart sunk a bit when I read 60 Minute Photo is one of the businesses housed in one of the buildings set for demolition. While I will hold out hope that they will find a new space, my gut says the will not. As an avid film photographer the possible loss of one of the few remaining labs that will develop medium format film locally (and within an hour no less) is very disheartening. I agree. I really hope 60 Minute Photo will find a new place, I love the service there and it is so hard to find a good film place, I have recommended it to many friends. Unless the condo market rebounds and they can then be the ‘first’ new condo on the hill. One door closes, another opens. The same cookie-cutter projects are going on all over the Cap Hill neighborhood and while we might think that density is a good thing what we sacrifice is any sort of uniqueness that we might have with every building looking basically the same. That stupid building will be blocking all the beautiful natural light that comes in the south end of the Chester building. I’ll be sure to move out when I start seeing bulldozers and dump trucks. UGH. Looks slick, just what Capitol Hill needs, less grunge more cosmo YAFEELME?